Water is the driving force of nature and raindrops can exert significant force and impact the lake shoreline. The resulting soil erosion is often difficult to detect and consequently is often ignored. Day in and day out, waves are generated by wind unto lake shorelines causing these banks to further erode. In addition, irrigation systems, and gutter downspouts create Rill erosion. This typically is caused by high velocity concentrated flows of water. Shoreline erosion results in a costly loss of property, undercut and scoured banks. By being proactive and addressing lake erosion problems early, positive results are achieved. It is critical to success to implement a strategic plan prior to conditions becoming worse. This approach also allows impacted owners to fund the restoration over a multi-year period, lessening the financial impact on homeowners. Riprap can be used to stabilize lake shorelines when banks are in need of moderate preservation. Site specific design and construction is key to secure a long-lasting result. When placed according to proper design methods at the correct slope, limestone rocks are time tested installation. The Geoweb system compiles a cellular three-D structure housing a network of interconnected cells that confine and compact soil. The action prevents erosion and improves the structural performance of the soil or aggregate infill. This application allows for sod to be placed above the high water control line while placing aggregate below the seasonal low water line. Cellular confinement has become the first choice of lake bank restoration applications in Southwest Florida. Turf Reinforcement Mats (TRMs) are permanent products made with synthetic fabrics securely sewn together. TRMs are used for 1:1 to 3:1 slopes for specific lake bank projects. 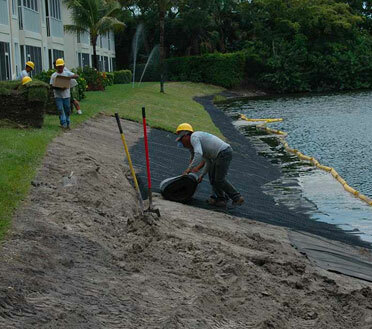 The mat is placed upon graded and compacted shorelines to provide shoreline stabilization. Permanent erosion control TRM’S stop soil erosion and provide sod installation. The fabrics we utilize are specifically designed material which will not biodegrade and will create a foundation for sod roots to take hold, extending the viability of grass beyond its natural limits. Please contact Florida Marine Construction for a professional consultation regarding your specific shoreline restoration concerns. View of severe escarpment erosion on lake shore. Barge mounted long reach excavator prepping shoreline for geo-web installations. Lake Bank Restoration, Gulf Harbor Marina. Rolling out TRM to incase in trench trough for stabilization. Pinning down TRM in preparation of sod placement. TRM with sod attached, awaiting #57 stone placement for anchoring. The photo depicts the quality of work Florida Marine Construction provides. Completed lake bank renovation with sod and native vegetation. Loading small long reach onto barge for lake bank remediation’s in Bonita Springs. View of eroded lake bank shoreline prior to remediation influence. Lake shoreline with scoured bank cleared for geo-web placement. Installation of clean washed lime rock rip-rap along lake shoreline. Another excellent lake bank restoration project Naples Florida. Florida Marine Construction completed bank remediation Gulf Harbor Marina. Florida Marine Construction installing Turf Reinforcement Mat, Gulf Harbor Marina.